K STREET – The house is still there at 1250 K Street, replete with painted slogans and redolent with animal waste. But the numerous two- and four-legged occupants who lived in and around Tom Vanciel’s urban homestead are gone, this time for good… probably. 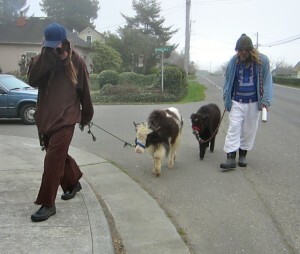 Vanciel is casually known as “Yak Man” for his strolls around town in the company of his yak. Sometimes he is accompanied by roommate Samuel Sanchez, known to casual observers at “Goat Man” for his town treks with his goat companion. In recent months, Vanciel and Sanchez have been joined at the house by kindred spirit Geronimo Garcia, whom one neighbor referred to as “Chicken Man,” for the flock of fowl which lived in and around his residential bike trailer in the driveway. Last Thursday morning, Arcata Police stood by as the house’s water service was turned off. But the yak, goat and chicken men had already departed. The house is now owned by the Federal National Mortgage Association, or Freddie Mac, which foreclosed on it last year. Though ownership transferred last Oct. 27, Vanciel and his flock refused to move out until last Thursday morning. Samuel Sanchez and Tom Vanciel roam about town with their companion animals. By the time it was vacated and secured last Thursday night, the $300,000 property had become an animal farm, inside and out. A dozen or so goats, a yak, chickens and possibly a cow had been living there with their human companions. The impacts of the dense habitation on the single-family residential home are easily seen – and smelled. The backyard, once a carefully tended wonderland, is a defoliated, waste-drenched bog. Former resident Rebecca LaCasse recalled when Mildred Moore, now deceased, owned the home. Those hardwood floors, as well as the walls, closets and even the bathtub are presently covered in pools of housepaint. 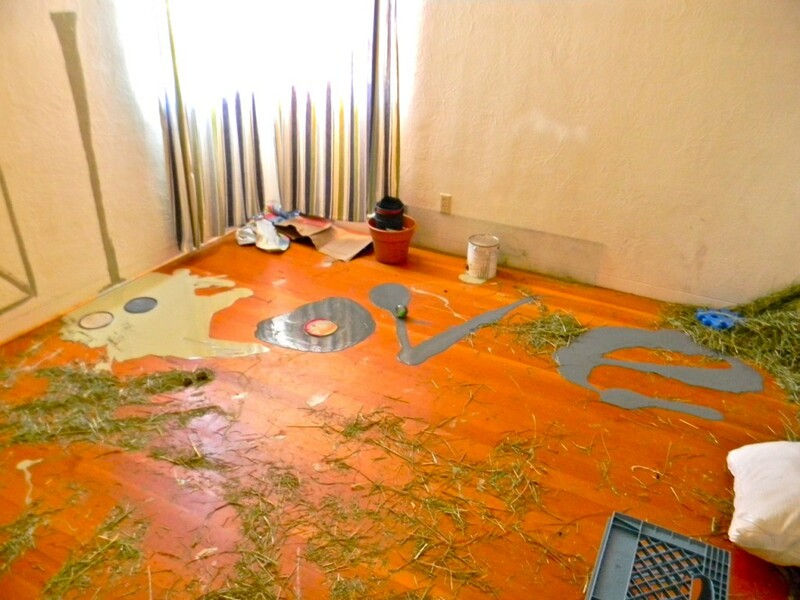 Thursday morning, the gray paint was still wet throughout the house, with the largest splatter in the front bedroom spelling out “LOVE” in capital letters. Straw and animal feces are strewn about– mingled with the wet paint in places – and the stinging stench of urine pervades the house. Bedrooms host abandoned personal knick-knacks and animal enclosures, while walls are covered in slogans advocating peace, liberty and understanding. “STOP HATE” is written in toothpaste on the bathroom mirror. A mixed-media, mixed message – love through vandalism? – in paint, straw and other random objects in the front bedroom. Since 2010, Vanciel has been ignoring warning letters from the City about Land Use Code violations for keeping the farm animals at his suburban home. Last May, he and his animals departed to the Southwest for a time, but the rugged individualist and his animal entourage returned to the home he purchased with his wife Nancy in August, 2007. When his wife moved out a couple of years ago, say neighbors, Vanciel’s eccentricities surfaced and magnified, as did negative encounters with authority. Facing foreclosure by Bank of America, Vanciel’s angry suspicion of the society around him intensified, and he dug in. Tapping into the energy around last fall’s progressive quasi-insurgency, Vanciel rechristened his home “Occupy Arcata Heights.” The in-town animal ranch, plus the modifications to the property, brought inevitable attempts at enforcement of Arcata’s Land Use Code in the neighborhood which is zoned Residential Low-Density. Each City complaint or letter from the bank only seemed to deepen Vanciel’s resolve and bring forth more conflict with neighbors, who were increasingly alarmed at the goings-on at his home. 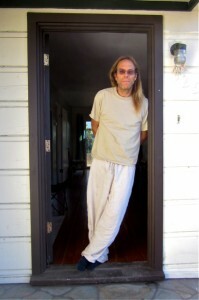 The final spiral began several days before last Christmas, when Vanciel got a letter from the Federal Home Loan Mortgage Corporation (“Freddie Mac”) warning him of imminent eviction. This was followed by another round of warning letters from the City, with a rare Nuisance Abatement agenda item slated for next week’s City Council meeting. As late as last week, City Building Official Dean Renfer was still corresponding with Freddie Mac officials about violations at the house. A letter dated Monday, March 5 notes building code violations over an addition to the garage roof, since removed, and the presence of large animals in violation of the Land Use Code. Neighbors said Vanciel had constructed a 24-foot-tall “meditation tower” in the backyard at one point. Last April, a neighbor complained that Vanciel had built a fence on his property, even nailing boards to the neighbor’s house. To Vanciel, the objections were a ruse to legitimize theft of his property and to silence his objections to government wrongdoing. In repeated complaints to the North Coast Unified Air Quality Management District, he claimed that toxic emissions from Rich’s Body Shop across the street had exacerbated his health problems, physical and mental. None of the alleged violations were ever verified. Nonetheless, Steer dutifully checked out the complaints. Vanciel also believes that fluoride in drinking water has corrupted the thought processes of those who consume it, making them obedient to government control. A neighbor passing by last weekend was told – loudly – she was in the grip of delusion by the “fluoride tea” that composes Arcata’s drinking water. Conversations with passersby followed a similar pattern – initially cordial, but swiftly escalating into shouting as Vanciel, Sanchez and Garcia would lose their composure. “He tends to run to the high side,” Steer said. 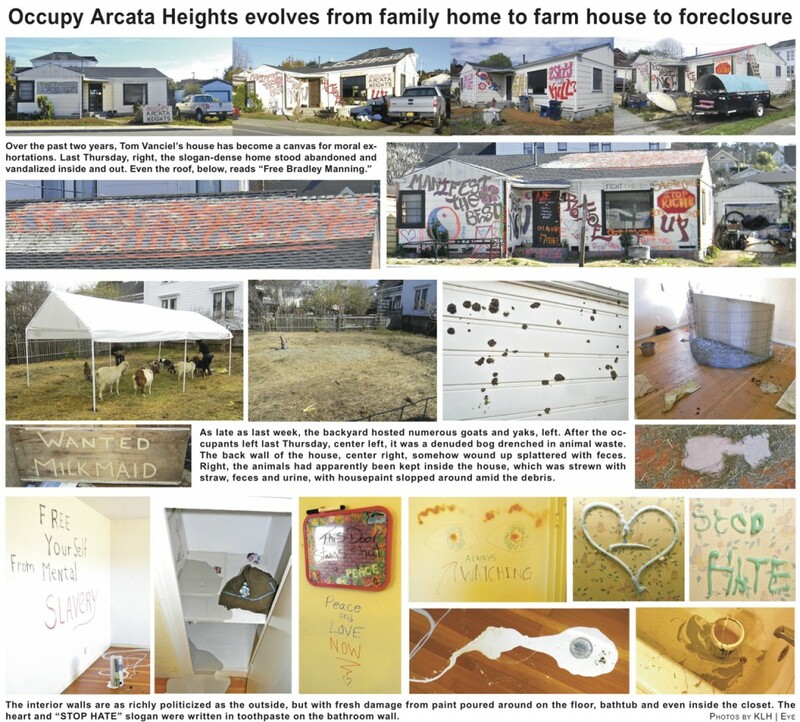 A photo layout from the pages of the Arcata Eye. Like Occupy emplacements at Arcata City Hall and in Eureka, the K Street occupation station was riven by internal dissension as well as rocky relations with the outside world. A neighbor reported loud arguments in the backyard, with Vanciel telling Garcia to stop drinking and warning him that he would be evicted. Somewhat comically, Garcia replied that Vanciel couldn’t evict him from a property he didn’t own, the neighbor said. A sign reading “Geronimo Motel” soon appeared in the house’s front yard in apparent mockery of the former City Council candidate’s continued occupancy. Despite heading up a City government which Vanciel had termed a “fascist puppet dictatorship,” the affable Mayor Winkler maintained neighborly, non-political relations with the irascible crew. He said Garcia told him that Freddie Mac had obtained a court order evicting everyone on March 8. With the house now vacant, Freddie Mac will presumably make repairs and put the property back on the market. The damage, while unsightly, is mostly superficial and reversible. But that resolution leaves some questions unanswered. Unknown for now are the present whereabouts of Vanciel and associates. Another riddle for many is the contradiction inherent in Vanciel’s ways – ardently advocating love, but usually with severe, hair-trigger hostility. Winkler said Vanciel was doing the best he could in uniquely challenging circumstances, pursuing his ideals despite severe emotional and financial hardship. “He had some difficult challenges,” Winkler said, noting that Vanciel’s wife had left him two years ago. This entry was posted on Wednesday, March 14th, 2012 at 2:16 pm	and is filed under News, Community, Animals, Business, Environment, Media, Health. You can follow any responses to this entry through the RSS 2.0 feed.